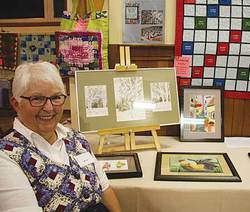 Crafty multi-tasker, Peggy Lunde, shown with her quilting projects and paintings. Sixteen local artists and thirteen quilters from the “Young at Heart” and “Sew Heavenly Quilters” Clubs displayed their lovely, fascinating, and unusual work at the 4th Annual Art Gala and Quilt Show & Sale on Thursday, September 26, 2013 held at the Warburg Cultural Centre. The Cultural Centre’s café area, showcasing Warburg high school art students’ ink drawings, provided fine art aficionados a cozy spot for conversation with wine and cheese or hot apple cider. Local Artists participating in this year’s gala displayed their sculptures; photographs; flower arrangements; oil and acrylic paintings; sketches; and a book, “The Guardian’s Wildchild,” by local author Feather Stone. Meta McDonald of Breton was the Gala’s featured artist. Though born in Truro, Nova Scotia, she has lived in Alberta most of her life. After completing an Education degree at the University of Alberta with a minor in fine arts, she launched the art program at Warburg School where she continues to teach. Having first explored oil paint and watercolour, she has discovered a new passion for a painting technique called encaustic. Encaustic technique is an ancient painting style that was practiced in the first to third centuries for mural painting. “Encaustic” derives from the Greek word enkaustikos which means to burn. Yes, fire actually is used in the creation of this art form. McDonald first melts beeswax in little aluminum “pie plates”, then she adds oil paints into the plates of melted wax to provide color, and then she applies the colored waxes directly to a surface (no pencil). The surface may be birch board, 300 lb. watercolour paper, or wood. She then uses a blow torch or heat gun to move the colored wax around. For added texture and dimension, a hot iron is used. The iron’s edge is used for cutting in sharp edges and its flat bottom for making smears. “As you are working, the scent of beeswax fills the room. It smells great,” McDonald said. She finds encaustic to be an amazing medium and loves the freedom of working with the blow torch in hand. There are three things will you notice about encaustic paintings. First, its famed luminosity; then, the unique way the colors blend; and finally the textural details—especially when viewed up close. McDonald also brought along a few prints of her encaustics. Her high school students will have an opportunity to explore encaustic studies as well. While the Art 10s and 20s will be restricted to the irons and heat guns, Art 30 students will learn the more advanced blow torch techniques. Art Gala participants included: Meta McDonald, Eleanor Jehn, Jean Gomuwka, Meta Siemens, Val Portas, Janette Barager, Peggy Lunde, Barb Eckert, Judy Weir, Peter Jacobs, Al Schoepp, Louise McBeath Schoepp, Vilma Ebl, Anne S. Gartner, Tricia Rumbles, Peggy Sue Cropley. “Young At Heart Quilters”: Nancy Gruninger, Carol Moar, Lois Moar, Sylvia Schnick. “Sew Heavenly Quilters”: Marg Bokowski, Sharon Johnson, Sylvia Flesher, Francoise Jardine, Elizabeth Kugyelka, Peggy Lunde, Elaine Mosicki, Shelly Munch, Beverly Schmidt. Sew Heavenly Quilters enjoyed having North Bay, Ontario quilter Kelly Moore join them during her recent visit with her aunt Beverly Schmidt. Both quilter groups have shown their generous spirit by donating many quilts for charity.